It has been reported in The Australian, that a shortlisted of developers has been for the future tender of the Sirius site. The article has named three developers: Poly, CWG International, China Aoyuan Property Group as being shortlisted. This entry was posted in news and tagged government, our, propertynsw, sale, save, sirius. Bookmark the permalink. Thanks for keeping us all updated on Sirius. 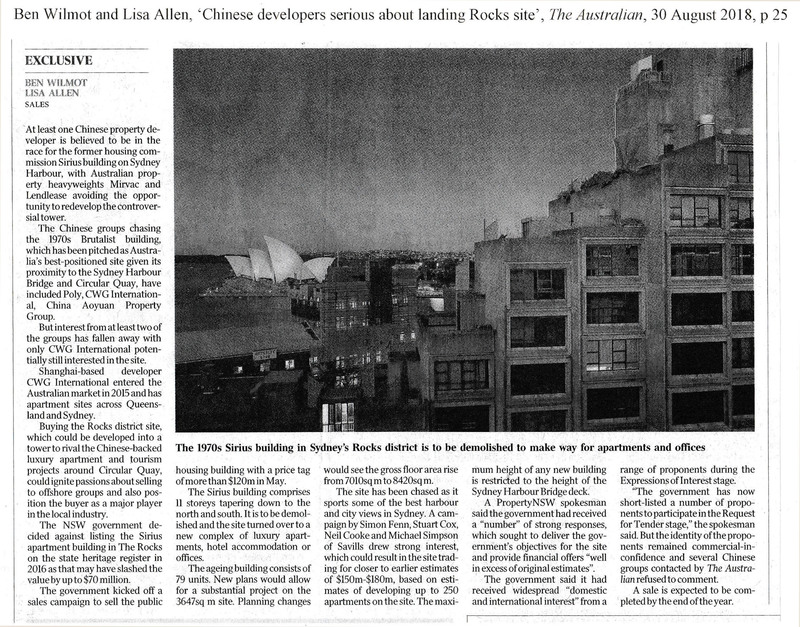 That article clearly says that Sirius, “is to be demolished and the site turned over to a new complex of luxury apartments, hotel accommodation or offices,” but isn’t Sirius on the heritage register? Can they really just demolish it, despite the heritage recognition, many protests and even international recognition? Would they run into any legal issues, considering it is the Government going against their own ruling? Unfortunately, Sirius is not on the heritage register. Global experts agree it should be added, but the NSW Heritage Minister Gabrielle Upton has ignored their advice – even the advice of her own NSW Heritage Council. It would be a great tragedy if Sirius were ever demolished. As a young man passing Sirius on the train each day I thought it looked modular, almost that like a Mechano set that could be unbolted and moved – do we know if Sirius could be “moved” rather than demolished? I liked the 1970’s architectural schematics with the heavy vine like vegetation cascading down from each roof-top – it would be wonderful to see Sirius in reality so green and heavy with foliage!